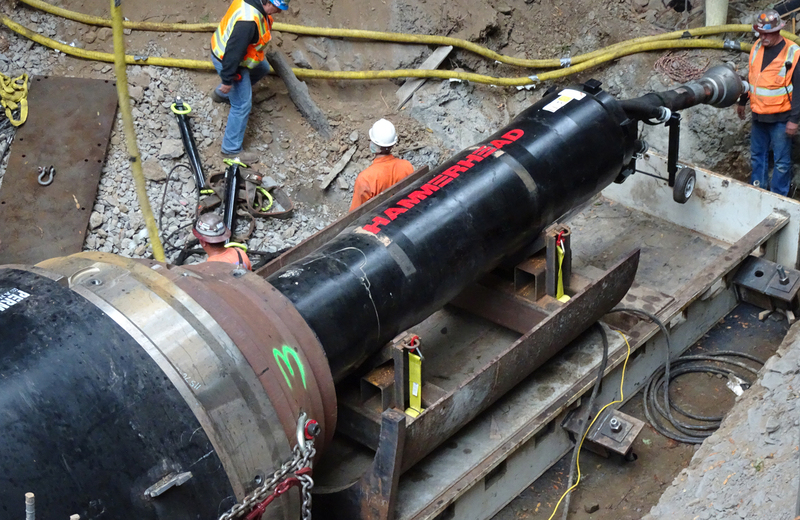 Drill Tech Drilling & Shoring Inc. first demonstrated its 34-inch HammerHead Trenchless pipe ramming tool while driving 108-inch steel pipe over a 54-inch culvert beneath the scenic Pacific Coast Highway. The technique is called “pipe swallowing.” The smaller-diameter culvert was removed with the spoil. The 34-inch pneumatic hammer made by HammerHead Trenchless, a Charles Machine Works company, is the world’s largest pipe ramming tool. Yet Drill Tech proved it could still be used in the tightly confined work space of an environmentally sensitive area, avoiding disruption to the busy traffic on the road above. Its next pipe swallowing job for the California Department of Transportation (Caltrans) was an even greater feat. The job called for ramming 250 feet of 72-inch-diameter casing over a 48-inch corrugated metal culvert with misaligned joints. At its deepest, the 48-inch CMP of this job lay more than 70 feet beneath Interstate 80 a quarter mile from Weimer Cross Road in Colfax, 45 miles northwest of Sacramento. The “as built” plan prescribed a 6.8-degree grade upward from the machine side of the installation. The length of run was difficulty enough. The lay of the pipe complicated the task. Drill Tech Engineer Brian Harris said they had originally wanted to swallow the culvert with 54- or 60-inch-diameter casing. After using a laser and prism to measure feasibility along the run, they knew they would need 72-inch pipe to handle its offsets. “The culvert really moved around, sort of zig-zagging one end to the other,” Harris said. Then work that began in December of 2016 was interrupted for five weeks by what Harris described as “one of the wettest winters in California history.” Torrential flow through the pipe caused operations to cease for almost five weeks after pipe was already halfway in the ground. That gave the ground ample opportunity to close tightly around the pipe and seize it in place. Drill Tech built check dams at the creek and lay filter socks around the work area to protect the creek from potential jobsite runoff. The crew shored up 200 feet of hillside around the culvert’s mouth, installed soil nails and shotcreted the vertical face at the culvert. Depending on soil conditions and supplied with up to 4,700 cfm of compressed air at 110 psi, the ramming tool can exert over 5.5 million pounds of impact force at 120 blows per minute. Drill Tech poured a cement slab 42-feet long, 13 feet wide, and 6 inches thick to accommodate the 27,500-pound ramming tool and a cradle-like sled, as well as to provide guidance for ramming angle and azimuth. Drill Tech secured the slab with eight micropiles and installed four reaction piles for a hydraulic pipe jacking tool kept on standby if needed for assistance. The balance of a shift was required to for two welders to join each section of pipe onto the run. Laborers on site throughout the project averaged just six to seven personnel per shift. Drill Tech had shut down in mid-December. It was well into January before they could return. The pipe had lain motionless in the ground for more than a month. Although it had rained steadily most of that time, the culvert lay beneath an impermeable “roof.” Above it lay 70 feet of compacted ground topped by a thickly paved interstate. They feared the ground may have seized the pipe. “But we hooked the ramming tool up to the pipe, and it continued as if it had never stopped,” Harris said. Harris never doubted that Drill Tech could complete the installation successfully. The company specializes in all forms of geotechnical solutions. Services that it provides to the construction industry from its California offices in Antioch and Corona include earth retention, foundation support, tunneling, shaft construction, ground treatment, dewatering and architectural shotcrete. 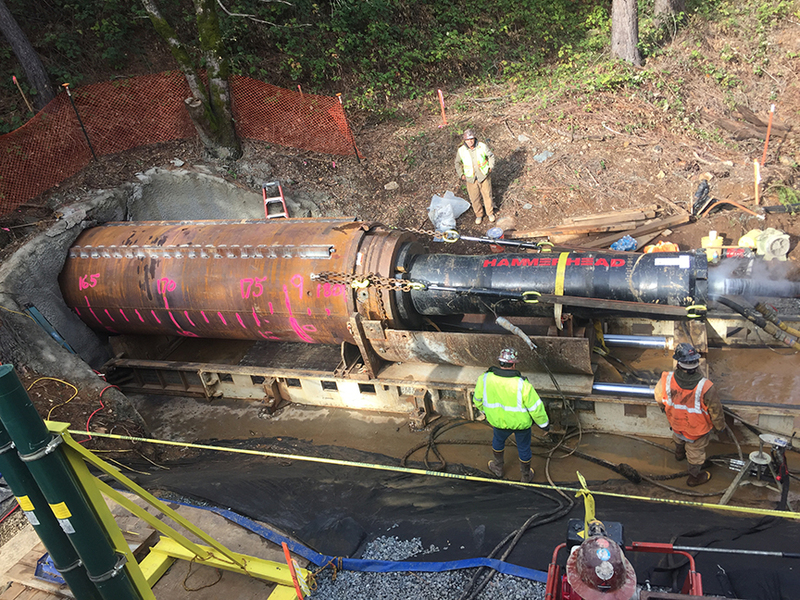 Its mastery of a complete range of geotechnical solutions now includes the pipe swallowing technique, whose value for difficult culvert replacement projects it has now proven twice on Caltrans projects. The pipe swallowing technique is based on conventional pipe ramming method, an economical and safe means of using pneumatic percussion to drive steel pipe in a wide variety of soil types. Its advantages over other pipe installation methods include minimum equipment outlay, relative simplicity of operation, and suitability for use in sensitive ground conditions without disturbing ground around the pipe or construction or surface features above. As it is driven in place, the pipe itself guards against cavitation, making it a preferred method for installing casing where subsidence is a concern, such as beneath roads and railroad beds. Traffic continues unimpeded by the ramming operations. Pipe ramming can often be used when other means of installation cannot. And in some cases, it has been used to save a project when another installation method has failed. The pipe swallowing version of pipe ramming is used to replace a pipe or casing in place with larger diameter casing. The casing is rammed around the existing culvert, which is then removed with the spoil.